This IBM® Redbooks® publication is intended for IBM CICS® system programmers and IBM Z architects. It describes how to deploy and manage Java EE 7 web-based applications in an IBM CICS Liberty JVM server and access data on IBM Db2® for IBM z/OS® and IBM MQ for z/OS sub systems. In this book, we describe the key steps to create and install a Liberty JVM server within a CICS region. 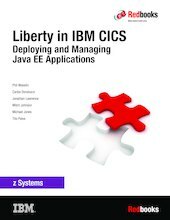 We then describe how to best use the different deployment techniques for Java EE applications and the specific considerations when deploying applications that use JDBC, JMS, and the new CICS link to Liberty API. Finally, we describe how to secure web applications in CICS Liberty, including transport-level security and request authentication and authorization by using IBM RACF® and LDAP registries. Information is also provided about how to build a high availability infrastructure and how to use the logging and monitoring functions that are available in the CICS Liberty environment. This book is based on IBM CICS Transaction Server (CICS TS) V5.4 that uses the embedded IBM WebSphere® Application Server Liberty technology. It is also applicable to CICS TS V5.3 with the fixes for the continuous delivery APAR PI77502 applied. Sample applications are used throughout this publication and are freely available for download from the IBM CICSDev GitHub organization along with detailed deployment instructions.